We absolutely need to use Designer Series Paper (DSP) on at least one Stamp Card – even if it is retired DSP. 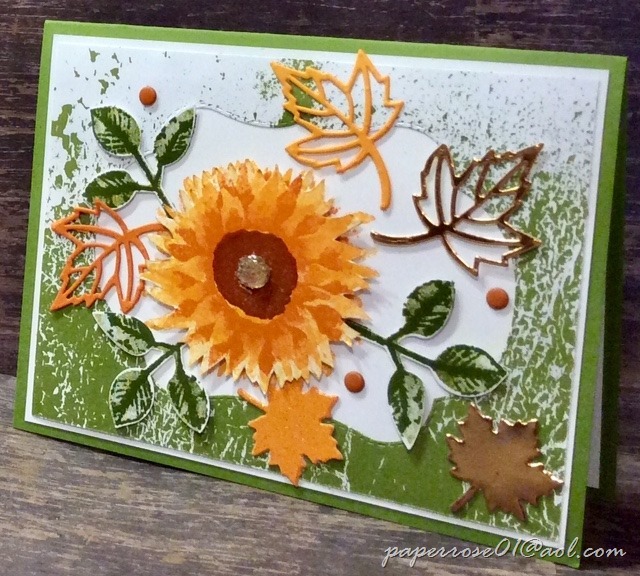 This fall card uses the Painted Harvest stamp set with the matching Leaf Punch and leaves from the Stitched Seasons Framelits and Seasonal Layers Thinlits. The die cut opening also comes from the Stitched Seasons Framelits. the DSP is layered onto Whisper White cs. An outer layer of the sunflower is stamped once or twice in Crushed Curry or Mango Melody (used here). 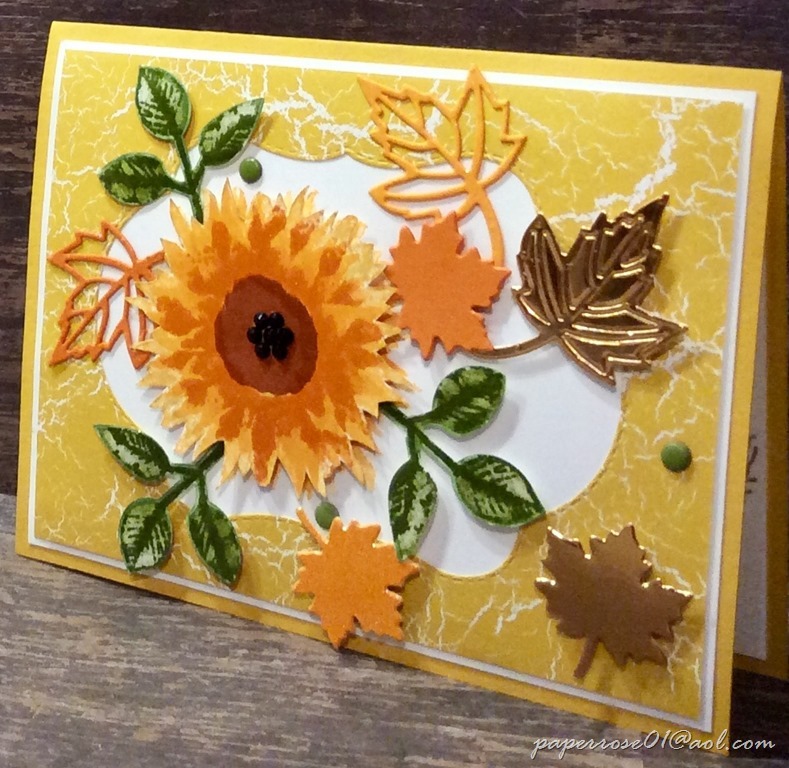 A completed sunflower stamped in Crushed Curry or Mango Melody, Pumpkin Pie, and Cajun Craze, is fussy cut with snips and popped on top of the outer sunflower image with dimensionals. 3 sunflower leaves are stamped, punched and adhered with dimensionals. 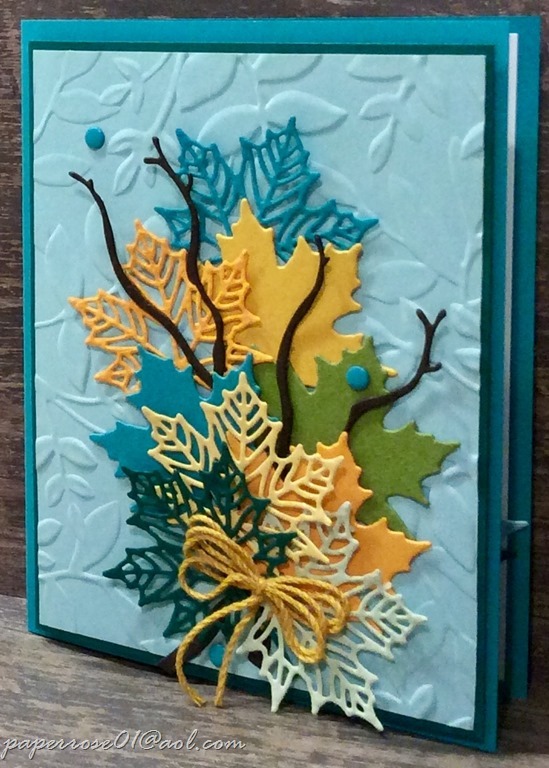 Detailed leaves in Mango Melody, Pumpkin Pie and Copper Metallic are die cut and adhered as well as 2 smaller die cut leaves in copper and either pumpkin pie or glimmer orange. Wink of Stella is an option for the detailed leaves and sunflower. A gold faceted gem was used in the center of the first sunflower and black rhinestones in the center of the second sunflower. Black rhinestones could also be scattered in the sunflower center to appear more “seed-like.” If preferred, there is a seed image stamp that could be used. For the message layer, the center DSP that was die cut is repurposed. A few pieces of wheat are stamped in Crumb Cake. We may see this stamp set again in November as this is a Thanksgiving set. I actually purchased it for use in 2017, but time ran out. As a reminder, September Stamp Camp is right around the corner – Thursday, September 6 from 1 – 7 PM, Friday, September 7 from 2 – 7 PM, and Saturday, 8 from 9 AM – 4 PM. I hope you can come and have a “Fallish” Good Time. If at all possible, please let me know if you are coming and which day works best for you. 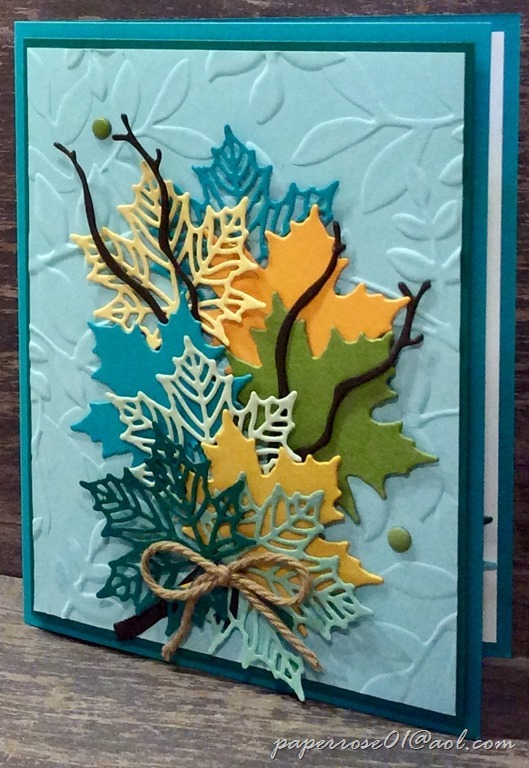 Fall Leaf Bouquet is a fun card using the branches and leaves from the Seasonal Layers Thinlits. This Bermuda Bay and Shaded Spruce card features a Pool Party layer embossed with the Dynamic Layered Leaves Embossing Folder. 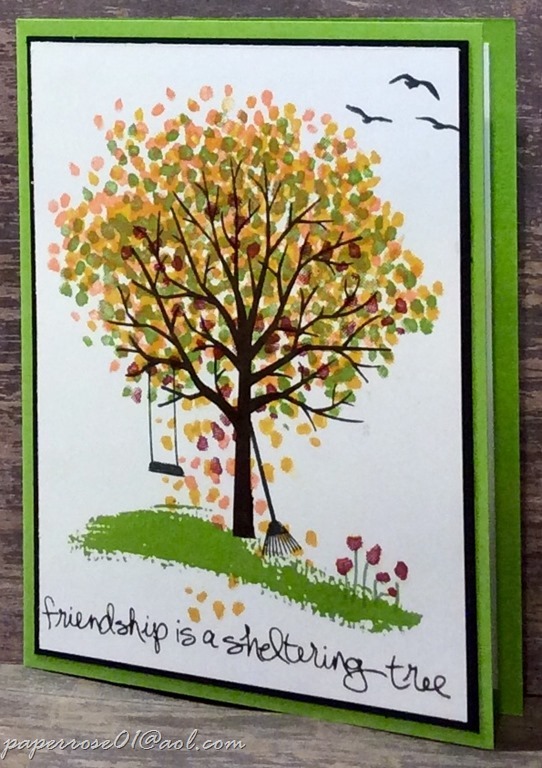 Remember, when using a dynamic embossing folder, only 1 standard cutting pad is used. Your layers from the bottom up will be (1) Big Shot Platform, (2) Single sheet of cardstock in folder, (3) Standard Cutting Pad. The 3D Dynamic Textured Impressions Embossing Folders are much thicker than the standard folders and can only accommodate the single cutting pad. layer. The branches and leaves are all adhered with glue dots – minis and micros. The leaves are die cut in shades of blue, green and yellow. There are 4 different colors of Baker’s Twine to choose from when forming a shoestring bow for the bottom of the bouquet. 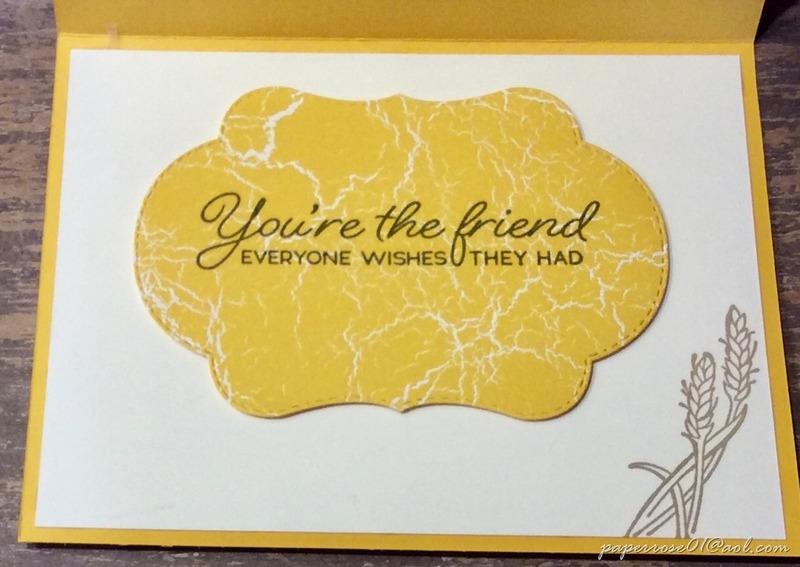 Retired candy dots are used to embellish and add interest to the card. I just noted that an Olive Green candy dot is missing. I recommend the use of 3-5 small embellishments for a card such as this. Wink of Stella was brushed on the cut out leaves and branches of this card. I do recommend you add the Wink of Stella BEFORE you put the card together – much easier than adding it to the completed card!!!!! Are you in a fall mood yet? Ready to see leaves on the trees turn red, orange, yellow and brown? Ready to rob your wardrobe for fall sweaters and flannel shirts? Fall is quickly approaching. The final card, Fall Sunflower, will be posted shortly. Don’t forget to let me know if you have any questions about September Stamp Camp on September 6, 7 and 8. As you know, we do a Christmas Card at each Stamp Camp starting in August. For September, we are working with the Dashing Deer bundle – page 9 of your holiday mini catalog. This Dashing Deer holiday card is done in Very Vanilla and Cherry Cobbler. 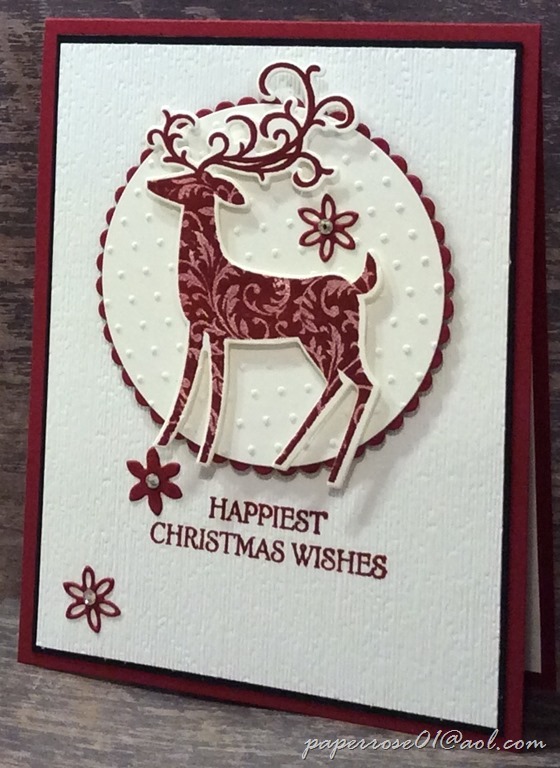 Although a very simple yet elegant card, the use of embossing folders adds so much. The Swiss Dot (long retired) folder is used on the large circle, and the new Subtle Embossing Folder adds the linen texture to the front card layer. I used the Stamparatus to stamp the deer. Why? Because I knew I would have a crisp image and could re-stamp if needed. Dimensionals were used to pop up the background circle, and to elevate the deer. Cutting the mini dimensionals in half allowed for stability to be added to the legs and antlers. 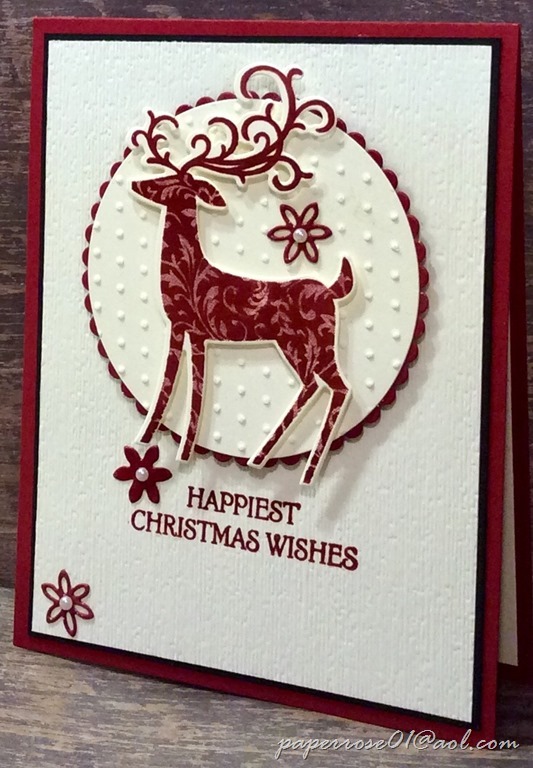 The die for the deer and the flowers make it so easy to produce this beautiful card. The second sample is very similar to the first. However, rhinestones were used as flower centers above, and small pearls were used as flower centers here. In addition, Wink of Stella was added to the Cherry Cobbler scalloped circle as well as the flowers. Wink of Stella was also used carefully on the antlers. As ink is picked up by Wink of Stella, the process was a bit nerve-wracking. If you look closely, you will find one or two splotches where the brush left its mark. There are 4 Thinlits of different deer as well as two nice floral corner Thinlits. This is a fun bundle to play with. Out next blog post will be of the Fall Leaf Bouquet. Stay-tune as the goal is to post it shortly. Welcome to September Stamp Camp! It’s kind of scary to see the year pass so quickly! Our theme for September is Fall Leaves and Flowers. As we are starting to prepare for fall, our first card will help put us in a “fallish” mood. 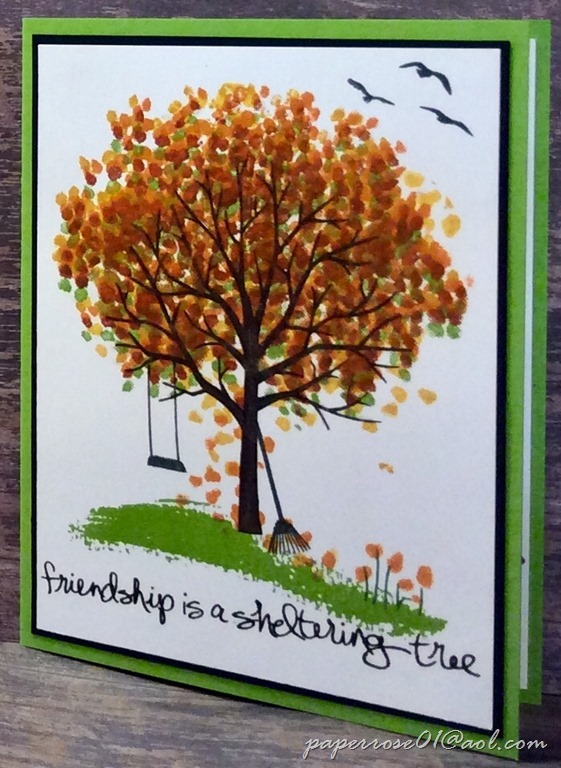 Sheltering Tree is a beautiful stamp set and I’m embarrassed to say I haven’t used it in several years. We last used this set for Stamp Camp during a spring month and our leaves were stamped in shades of pink. This set is great for all seasons – no leaves in the winter with a touch of snow, shades of green during the spring and summer months, and now fall leaves for our upcoming season. 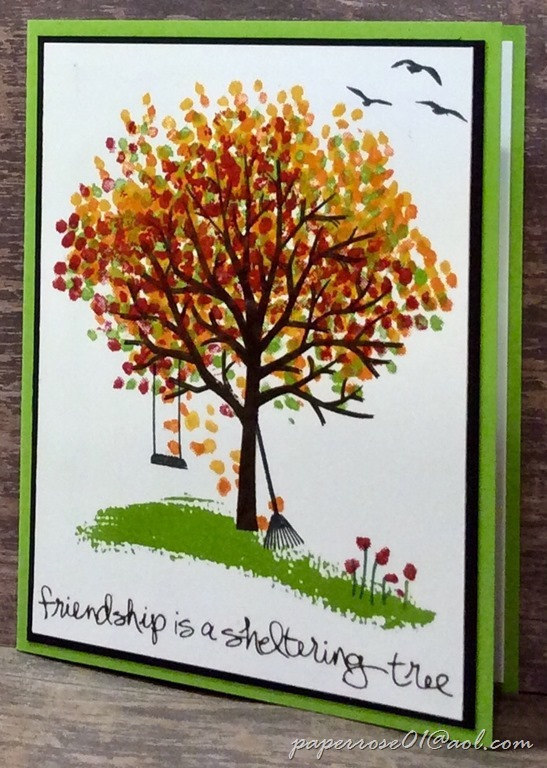 The sentiment on the front card layer is one of my absolute favorites: friendship is a sheltering tree. flower stems were stamped in Garden Green and the flowers in one of the colors of the leaves. The tree was stamped in Early Espresso. All 3 samples started with a layer of Granny Apple Green leaves. The other colors used included Pumpkin Pie, Crushed Curry, Cherry Cobbler, Cajun Craze, Grapefruit Grove, and Merry Merlot. Each tree was limited to 4 colors for the leaves. The live samples have a recipe showing the order each color was used for each card. The Stamparatus was a big help in stamping the rake and swing with exact placement guaranteed. There is also a bike that requires 2 stamps. if you wish, you can add the bike to your card. The birds in the upper right corner are an addition from the High Tide Stamp Set. Finally, touches of Wink of Stella help provide a bit of shine. When using Wink of Stella on inked images, you need to remember that the brush will pick up the ink. I used splotches of Wink of Stella and made sure my brush was clean. As you can see, each tree looks slightly different. Your tree will look a bit different from my samples. September Stamp Camp is on September 6 from 1-7 pm, September 7 from 2-7 pm, and September 8 from 9 am-4 pm. The cost remains the same – $12 for 4 cards and $2.50 for each additional card. As always, all tools, supplies, water and soda are included in the price. It is helpful if you can let me know if you are coming and on which day. This insures I have sufficient card stock cut but am not wasteful by cutting too much.